Beautiful, bright cheerful country home with 2 garages and a large barn. Move in condition. The home features Beautiful wide plank floors, formal dining room, spiral staircase, 4 large bedrooms, first floor laundry room, a beautiful bi-level deck looking out on to all the little gardens and more. Cincinnatus Elementary School Pre-School, Elementary School / Public 2 5 mi. Cincinnatus Middle School Middle School / Public 5 5 mi. Cincinnatus High School High School / Public 7 5 mi. Marathon Christian Academy * Pre-School, Elementary School, Middle School, High School / Private N/A 6.41 mi. William Appleby Elementary School * Pre-School, Elementary School / Public 4 6.34 mi. Marathon High School * Middle School, High School / Public 4 6.55 mi. near 1325 Lower Cinncinatus Rd. Recent Sale Prices near 1325 Lower Cinncinatus Rd. 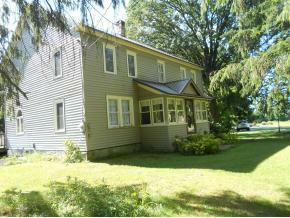 1325 Lower Cinncinatus Rd., Cinncinatus, NY 13863 is a 4 bedroom, 1.5 bath single family home was sold for $165,000.